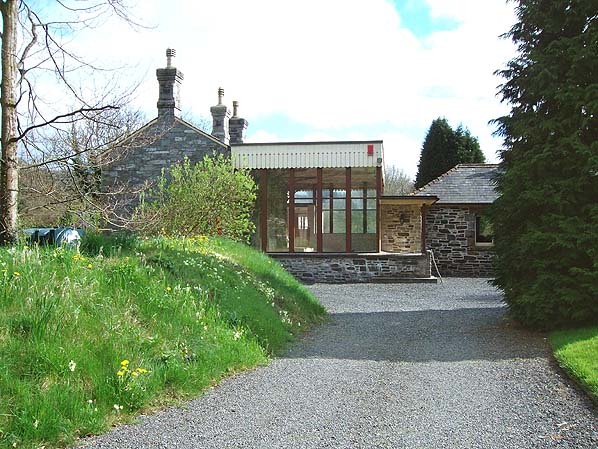 Present state: By 1982 the station has been converted into a private dwelling. The building has now been extended across the track to the opposite platform where the waiting shelter survives as part of the house. Notes: Gara Bridge was the principal intermediate station on the branch and the only station with a passing loop. Apart from the up platform and loop, the station was very similar in design to the other intermediate stations with a grey stone with rectangular granite framed windows and square topped chimneys. Before the opening of the branch line to Kingsbridge the town was served by Wrangaton Station which was opened on the 5th May 1848 on the South Devon Railway which had opened between Exeter and Plymouth in 1846. Shortly after opening the station was renamed Kingsbridge Road, but reverted back to its original name when the GWR opened the Kingsbridge branch in 1893. The Kingsbridge branch was a long time coming as many local residents didn't support the line as the town was served by three good coach services. The Kingsbridge & Salcombe Railway was incorporated in 1882, the company being taken over by the Great Western Railway in 1888. 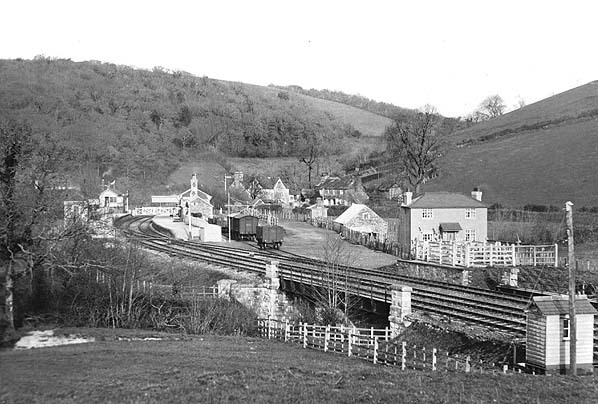 The line left the Exeter - Plymouth line at Brent which became a junction station and followed the scenic Avon Valley for 12.3 miles into Kingsbridge with intermediate stations at Avonwick, Gara Bridge and Loddiswell. The line crossed the River Avon ten times but the only major engineering feat was the 638 years Sorley Tunnel which takes the line beneath Sorley village. Because it hugged the narrow Avon valley there was barely a straight length of track on the whole branch with the three intermediate stations and the terminus at Kingsbridge all built on a curve. The line was single throughout with a passing loop at Gara Bridge Station. Initial plans to extend the line five miles south along the side of the estuary to Snapes Point at Salcombe were never implemented and Kingsbridge remained the railhead for Salcombe. The opening of the branch brought new prosperity to Salcombe but the failure to extend beyond Kingsbridge prevented the wholesale development of the town as a tourist destination. In the early days a horse drawn coach did brisk business meeting trains and taking passengers on to Salcombe. The line, which became known as the Primrose Line had a quite life relying heavily on leisure traffic. In 1934 the GWR introduced 'camping coaches' at the the stations consisting of old coaches converted into holiday accommodation. The weekday Cornish Riviera Express carried a through coach for Kingsbridge which was detached at Exeter in the down direction and attached to the up train at Newton Abbott. At weekends the branch had a direct service to and from Paddington. During WW2 there was an increase in traffic during the build up to D-Day. After the war passenger traffic dwindled during the 1950's due to the popularity of the car and it came as no surprise that an early closure under the Beeching proposals was announced. It is interesting to note that traffic on the Kingsbridge line increased by around 25% in its last twelve months of life and a summer Saturdays through train to Paddington was packed out during the summer months prior to the lines closure. Goods traffic at Kingsbridge was also very heavy during the last summer on the line but there was no last minute reprieve. The line lost its passenger and goods service on 16th September 1963 despite a spirited local campaign to keep the line open as a preserved line. 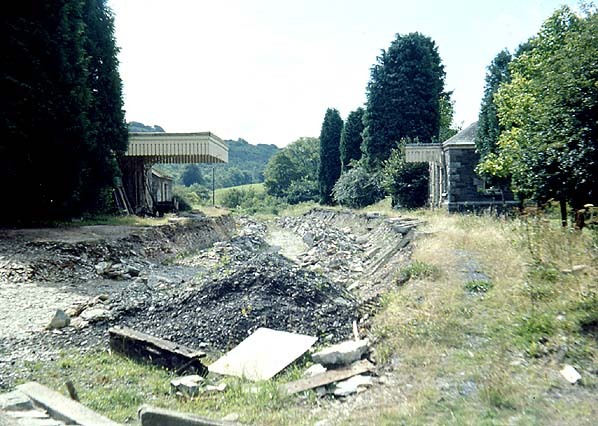 This campaign failed at the 11th hour due to the intransigence of the British Railways Board and the group turned their attention to the Buckfastleigh line which opened as the Dart Valley Railway in 1969 and now operate as the South Devon Railway. Track lifting along the Kingsbridge line was completed in May 1964. Today parts of the route has been turned into a public footpath although plans for a cycle way were dropped. Sorley Tunnel has been used as part of an Adventure World tourist attraction but this is now due to close.